Watch collectors are different. We watch movies, read magazines, and study videos -- not for the usual type of entertainment, not for the intended content -- but to see which watches the stars and celebrities are wearing. Whether we are looking for Steve McQueen with an "orange hand" Rolex, trying to identify Jerry Seinfeld's vintage Heuer Autavia, or seeing whether Paul Newman is wearing a "Paul Newman", we focus on the watches. So in the United States, in the year 2008, it is not surprising that there is a new subject of such intense horological focus. In September 2008, the most photographed and filmed person is no longer Tiger Woods with his TAG-Heuer (as he is recovering from knee surgery), and it is no longer Michael Phelps (as the Olympic torch has been doused). 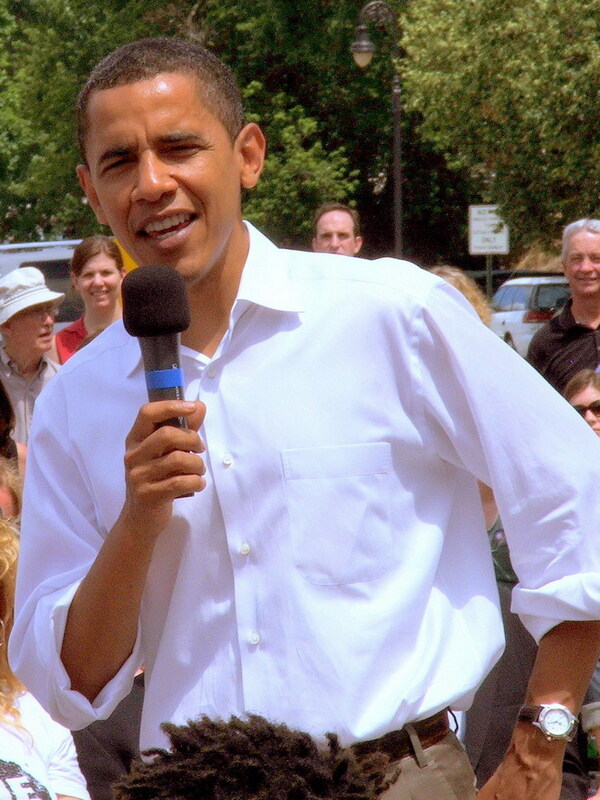 Rather, the most photographed person in the U.S. of A. in September 2008 seems to be the Democratic nominee for the U. S. Presidency, Senator Barack Obama. So which watch does Barack Obama wear? That seems like a simple enough question. 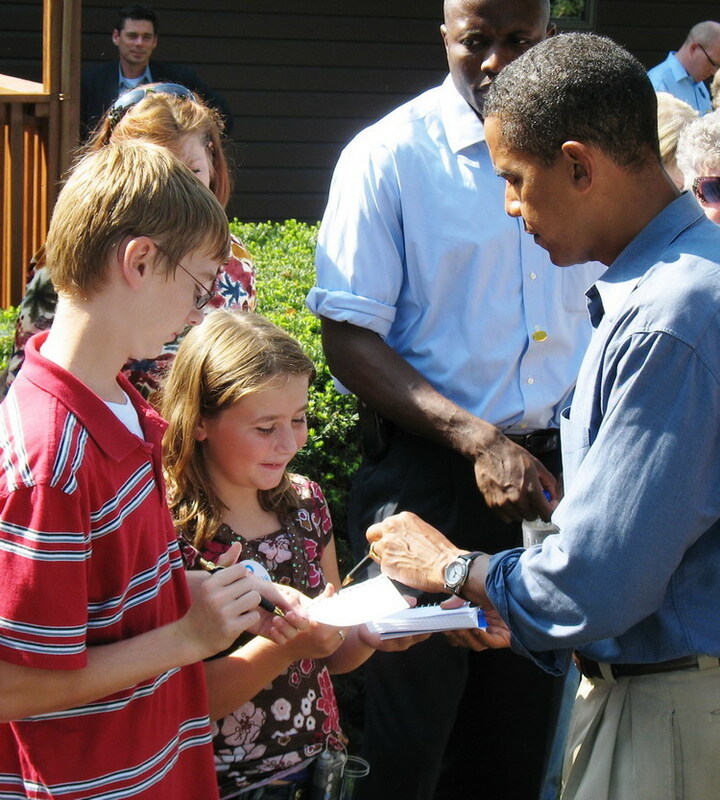 No sooner had he hit the campaign trail, in early 2007, than the "watch guys" started studying the photos, trying to identify his watch. And he was an easy study. With an image for being somewhat casual, and summertime tours through the Southern states, he often rolled up his sleeves. And when he rolled up his sleeves, the watch freaks saw a big, stylish watch . . . not the usual plastic Timex or Casio, so popular among those running for office (or in office), but a large, light-dialed sport style watch. But was this watch? The discussion forums came alive. Most experts saw a light-dialed TAG-Heuer sports watch . . . probably either a Series 1000 or Series 2000 . . . one of the common quartz watches of the mid-1990's. Then suddenly, something strange happened late in the year 2007. In the place of this rather common TAG-Heuer, the experts spotted a huge black Panerai; others saw a black-dialed Carrera re-issue; and still others saw a Royal Oak, something that Governor Schwarzenegger might wear. Wow!! Could this be true? That rather than switching from the TAG-Heuer to the nondescript Timex or Casio, Senator Obama was actually stepping up his horological game? Could it be that he had gone from Wal-Mart to Wempe? What would the pollsters say? What would McCain say? 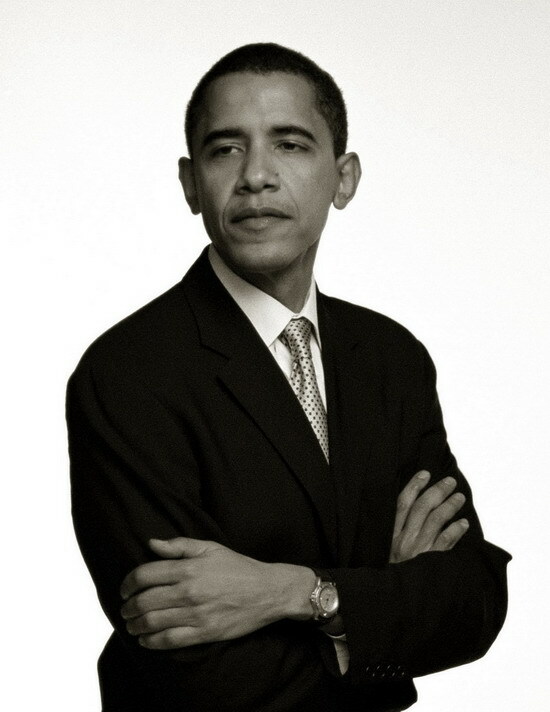 Could this man of the people, the law professor and community organizer, be wearing a high-end Swiss watch? What would the Japanese say? 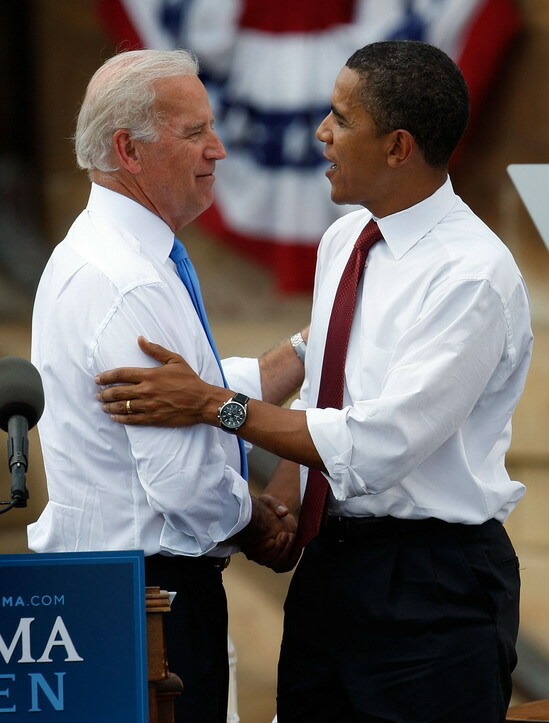 Suddenly, the watch guys began to spread the rumor that Obama was also a watch guy! 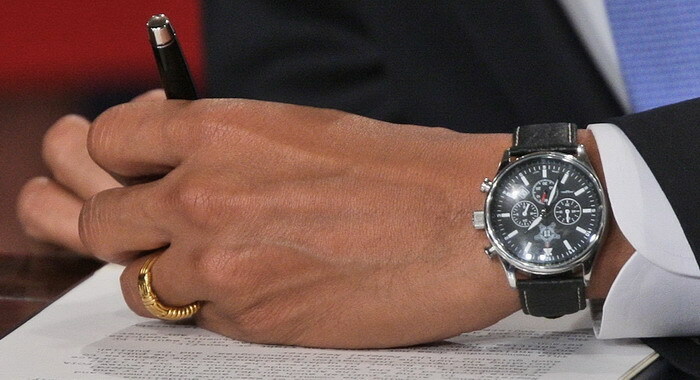 This webpage will explore the mystery of Senator Barack Obama's watches. Which watches has he worn? When did he wear each of them? 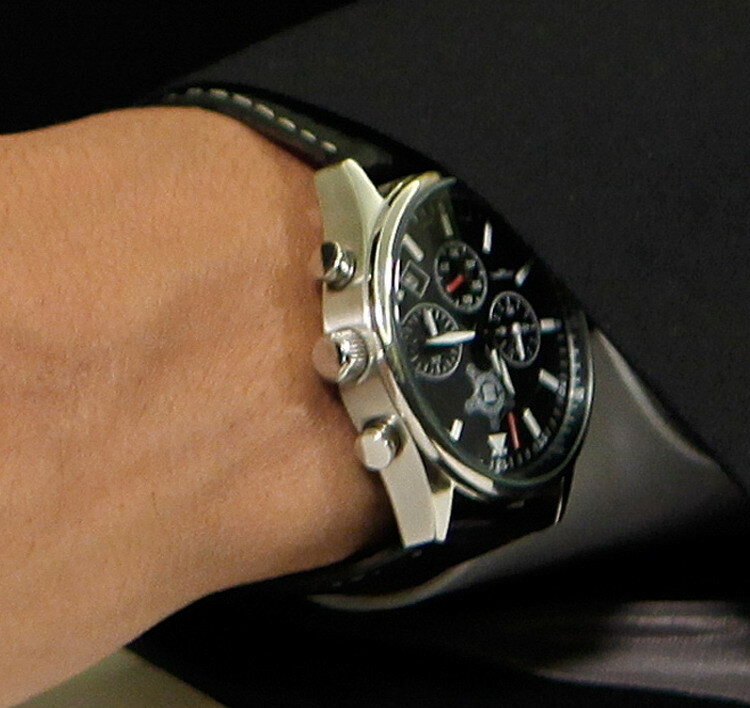 Why did he switch from the simple three-handed sport watch to the massive three-register black chronograph? And what does this mean for the future of democracy in America? As is so often the case, upon closer inspection, things are not as they first appear to be . 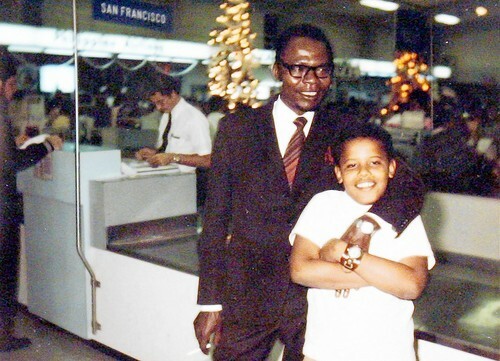 . .
A careful examination of the available photographs suggests that Barack Obama wore a TAG-Heuer Series 1500 Two-Tone Divers watch, from the early or mid-1990's until late 2007. Over this period, this seems to have been his "daily wearer", the one and only watch that he wore over this period of 10 or 15 years. 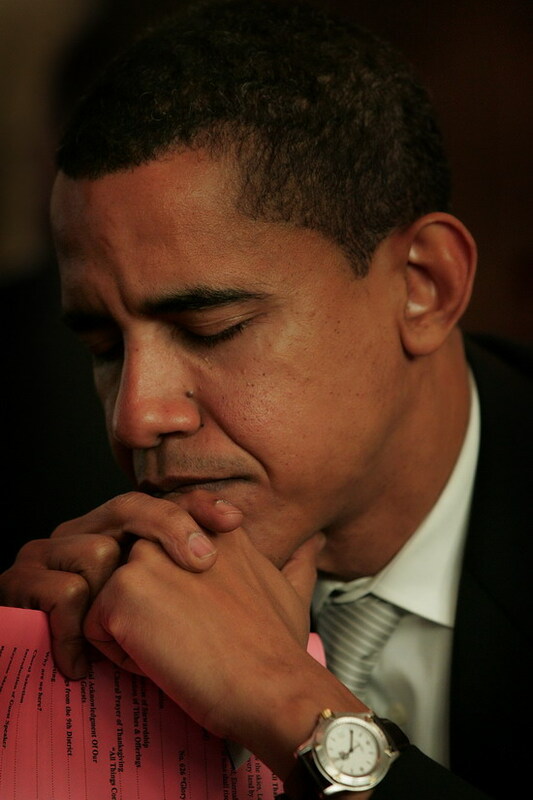 Of the thousands of photos of Senator Obama that we find on the internet, from Google to Flickr to Getty, the following are some favorite photos that capture the spirit of Senator Obama and his watch. You can click on any of these images, to see a close-up photo of the watch. In addition to these favorites, here are some "quickies" . 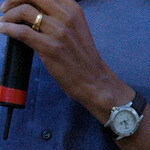 . . photos showing Barack Obama, on the campaign trail, with his trusty TAG-Heuer, all along the way. 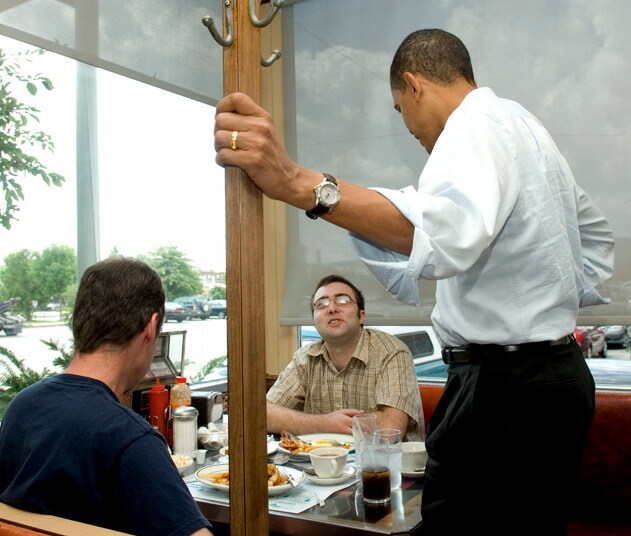 Chatting at the diner, signing an autograph, or addressing the crowd . 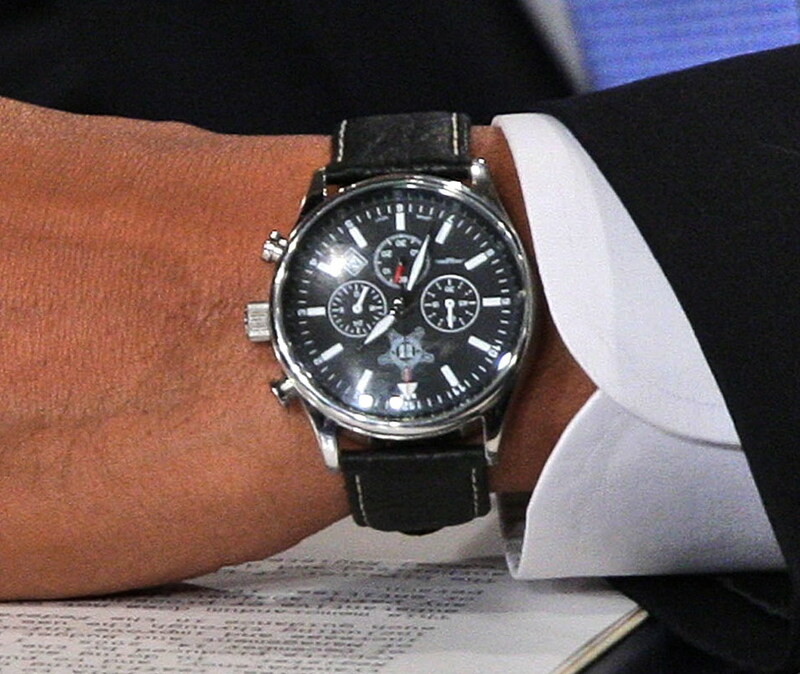 . . Obama seems to have worn his TAG-Heuer every day. Design -- oversized chronograph, with tri-compax design -- 24-hour indicator at three o'clock, continuous seconds at six o'clock and chronograph minutes at nine o'clock; quick-set date at 4:30 position; luminous markers and hands. Measurements -- The chronograph measures 41 millimeters across the dial (not counting the crown); 47 millimeters from top of top lug to bottom of bottom lug; thickness of 13.5 millimeters (from case-back to top of domed crustal; 22 millimeters between the lugs (strap wdith). 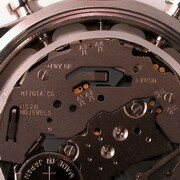 The Movement -- This chronograph is powered by the Miyota Caliber OS-20 movement. 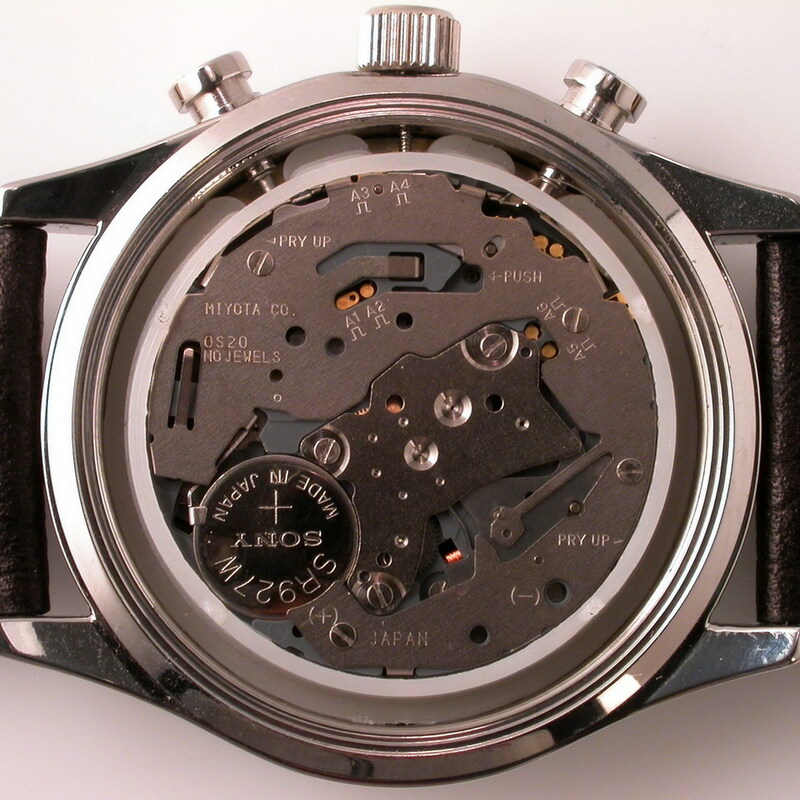 The OS20 movement is a 13-1/2 ligne movement (30.80 mm), with a height of 5.10 mm, accurate to within 20 seconds per month. Here are full specifications of the OS20 movement. Miyota is a subsidiary of Citizen Watch Co., LTD. Japan. These OS20 movements are available from supply houses in the United States at a price of approximately $25 per movement, as shown here. 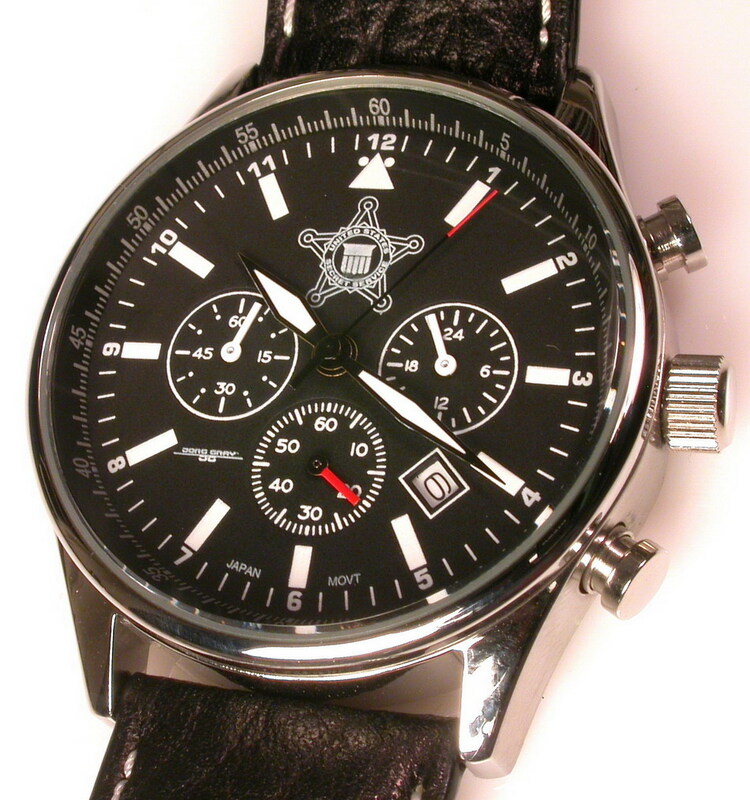 This Secret Service chronograph sells for approximately $210 in the employees' store. This store is operated by the United States Secret Service Employee Recreation Association ("ERA"), and all profits from the store go to charities supported by the ERA. 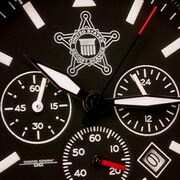 The employees' store is not open to the public; accordingly, these "Barack Obama Secret Service Chronographs" are destined to remain scarce among the chronograph collectors. 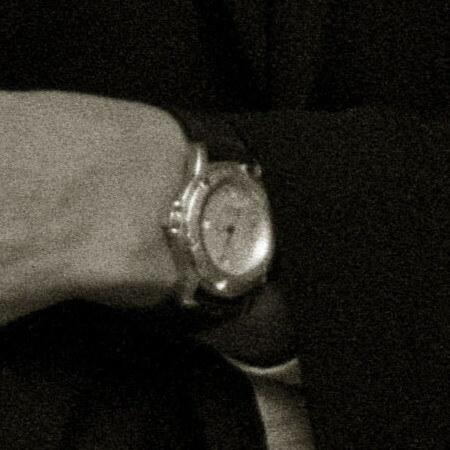 Which TAG-Heuer Model is It? 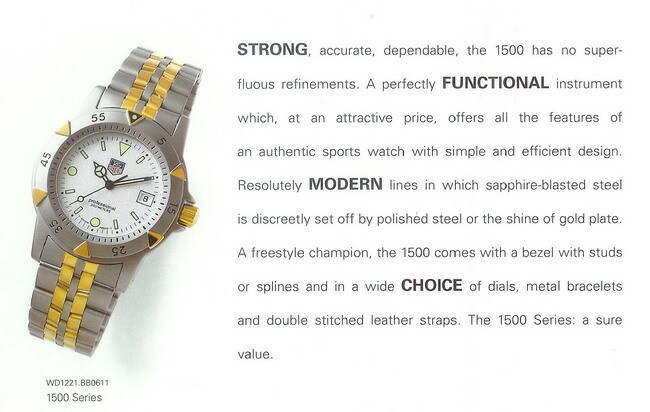 Barack Obama's TAG-Heuer watch is a Series 1500 Two-Tone Diver (as shown in the catalog page below). 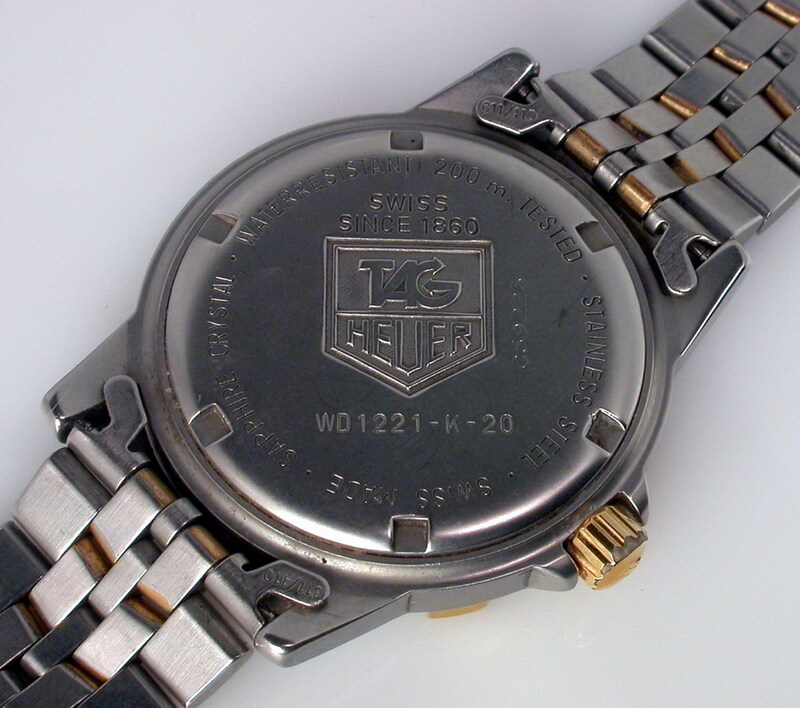 TAG-Heuer introduced the Series 1500 watches in 1991, after the Series 1000 watches had been discontinued. 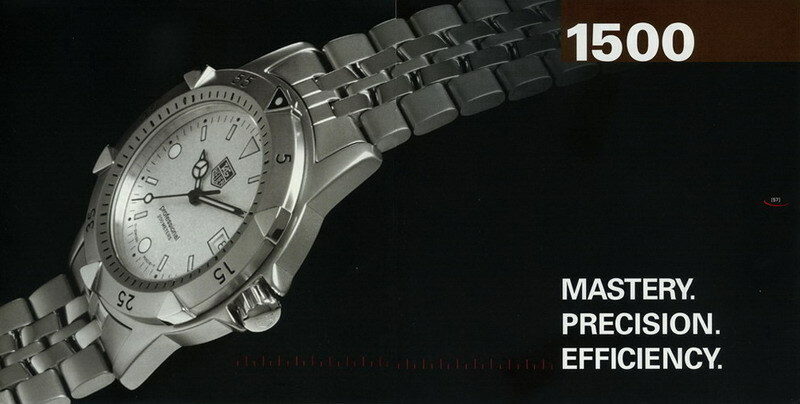 The Series 1500 watches were intended to sell at the price point below the Series 2000 watches, and some of the catalog pages shown below emphasize the "value" of the Series 1500 watches. In this era, TAG-Heuer was marketing its watches and chronographs as "professional sports watches", with an emphasis on diving watches and chronographs. The Series 1000, 1500 and 2000 watches were described as being "first and foremost functional pieces of diving equipment". Consistent with this positioning, the watches featured water resistance to 200 meters, screw-down crown, double safety clasp, unidirectional turning bezel, sapphire glass, and luminous pointers. Perhaps the most distinctive feature of Senator Obama's watch, which sets it apart from other TAG-Heuer chronographs of the period and makes it easily recognizable in numerous photos of Obama, is the raised triangles on the bezel. The bezel has these raised triangles at 00-10-20-30-40-50, with numerals at 5-15-25-35-45-55. On the Two-Tone model, these raised triangles are gold-tone, as is the crown. The steel model (shown below) has these raised triangles, but they are steel, rather than gold. The Series 1500 Two-Tone Diver was available in three sizes -- the Full-Size (sometimes called "Oversized"), the Three-Quarters (also called the "Mid-Size"), and the Womens. 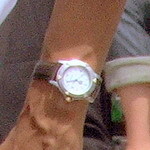 The Series 2000 watches were avaliable in a fourth size, between the Three-Quarters and the Womens, with this fourth size called the "Unisex". 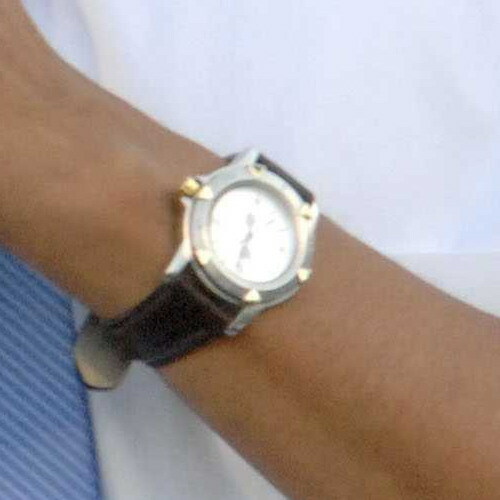 Obama's TAG-Heuer is either the Full-Size model or the Three-Quarters (Mid-Size) model; these two watches are identical, other than the size of the case. The dials on the Series 1500 Two-Tone Divers were a distinctive "granite" color throughout most years of production. 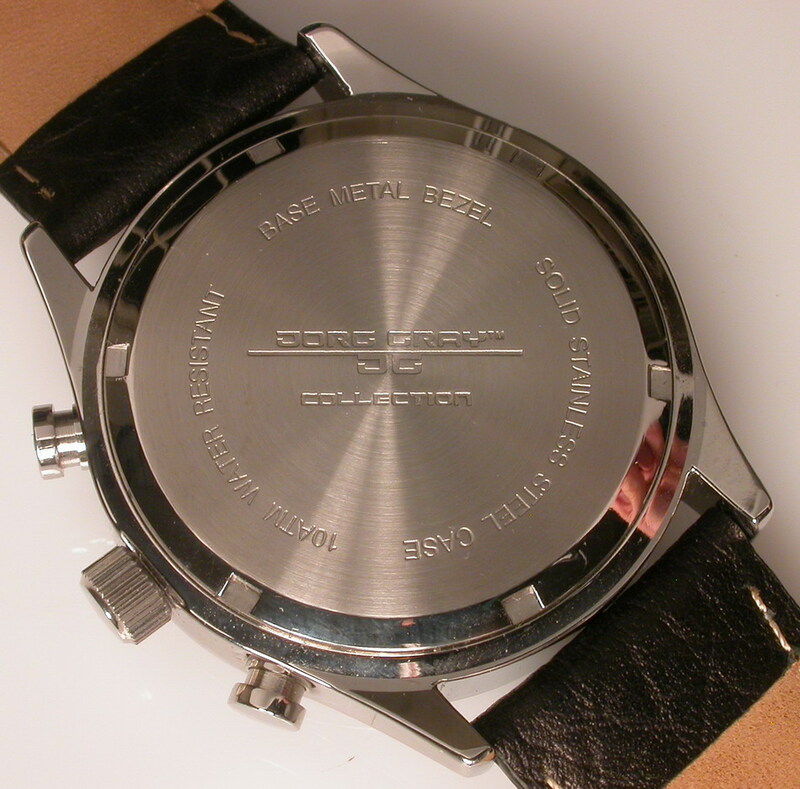 This watch was produced with a white dial only in the final period of production (circa 1998). When introduced in 1991, the Series 1500 Two-Tone Diver sold for $625 on the bracelet or $575 on the leather strap. 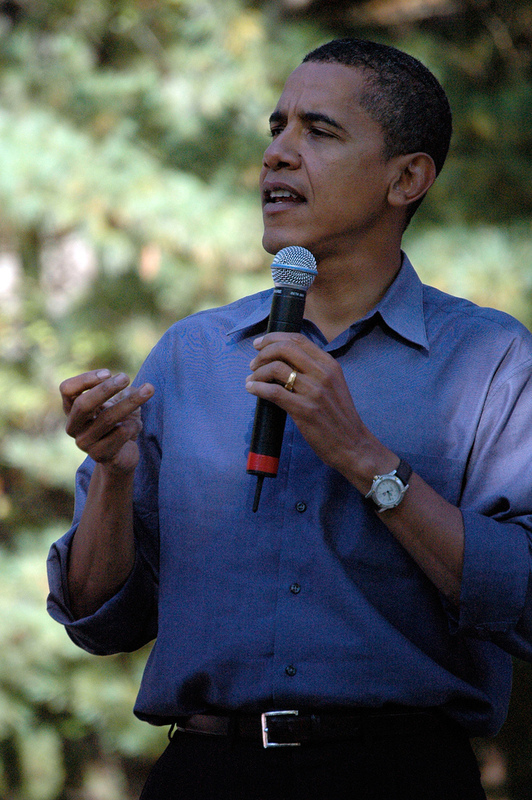 The watch shown below appears to be identical to the Series 1500 Two-Tone Diver worn by Senator Obama, except that Obama's watch has a leather strap, rather than the bracelet. 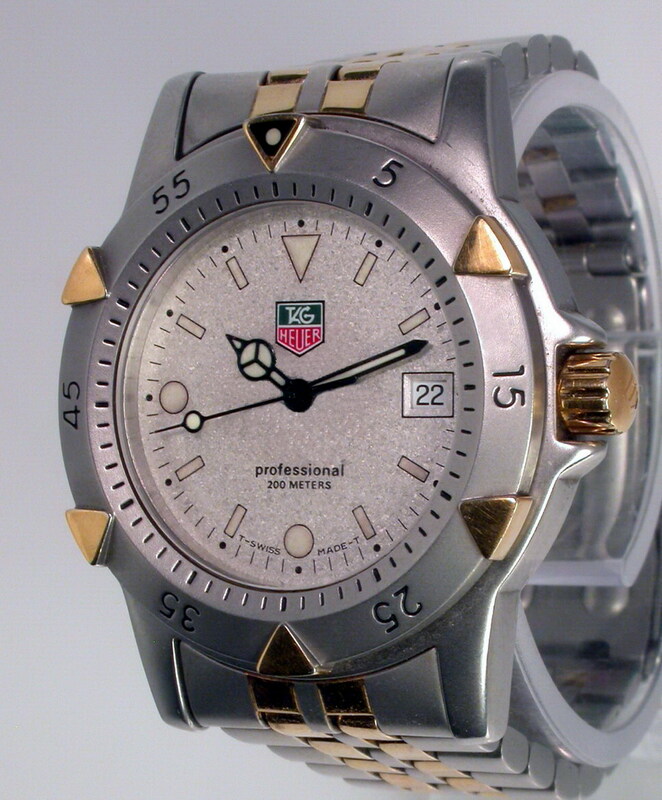 The model in TAG-Heuer's current line of watches that might be considered the closest successor to the Series 1500 Two-Tone Diver is the Reference WAF1120.BB0807, part of the Aquaracer series (shown below). So Is Obama a "Watch Guy"? Prompted by sightings of his TAG-Heuer Series 1500 Two-Tone watch and his oversized Secret Service chronograph, the conversation on various watch discussion forums naturally turned to the question of whether Senator Obama might be a "watch guy". There is no reason to think that Senator Obama is a "watch collector". Still, the photos suggest that he wore a watch at a relatively young age, and that he wore his TAG-Heuer on a daily basis over several years. 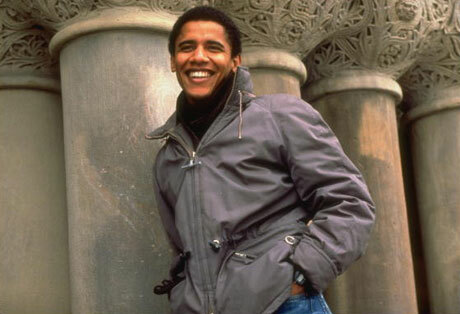 The photograph below shows Barack Obama at Harvard Law School, wearing what appears to be an inexpensive plastic quartz watch. 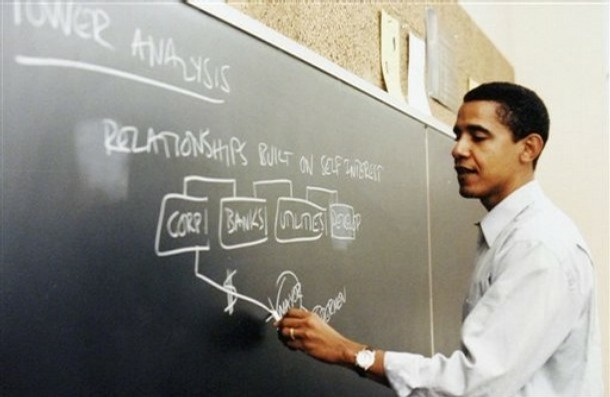 Obama graduated from Harvard Law School in 1991, began teaching at the University of Chicago Law School in September 1992, and was married in October 1992. Could the TAG-Heuer Series 1500 Two-Tone watch have been a gift to mark one of these occasions? 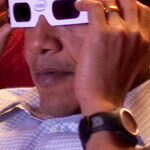 Or did Obama buy the watch for himself, when he joined the workforce (1991-92)? Some will skim this page or read the postings on watch discussion forums and ask why any of this matters. Indeed, in the larger scheme of things, most voters will be more interested in Senator Obama's positions matters such as taxes, international relations, national security, and individual rights, and less interested in his selection of this watch, some 15 years ago. By the same token, watch enthusiasts may question whether Senator Obama's selection of a TAG-Heuer really means much, for the TAG-Heuer brand or for watch collecting, in general. In short, maybe the fact that Barack Obama selected this watch and wore it for so many years is just not that important? 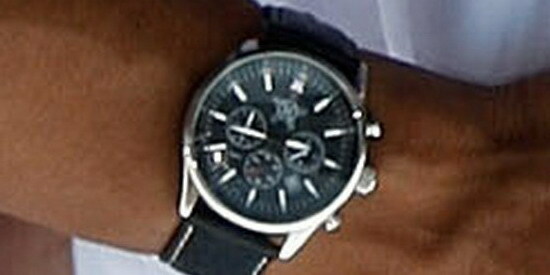 But returning to the language and habits of watch collectors, Barack Obama's TAG-Heuer is an important watch. 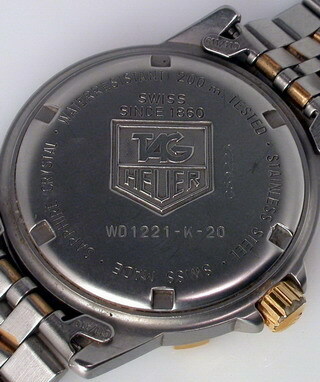 Obama's TAG-Heuer may not be as important as the Rolex that Marilyn Monroe had engraved for President Kennedy. It may not even be as important as the Timex that President George W. Bush seems to have lost, while working a crowd in Albania. Still, this watch is important, as the watch that a young man selected ,as he embarked on his career or when he was married, and seems to have worn regularly every day for the next 15 or so years. In the imagery that the watch brands seek to create, here we have a man of action, an adventurer, a sportsman, wearing a watch that suits his personal style so well. 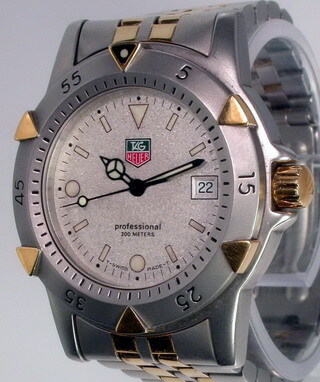 Is Obama's selection of this TAG-Heuer as important as matters of world peace and the wellbeing of our nation? Absolutely not. Still, as a Heuer collector, I am happy that he chose this one, and not a Rolex, an Omega or a Timex. Barack Obama's Inauguration as the 44th President of the United States occured on Tuesday, January 20, 2009, and the watch watchers had one question in mind, as they watched the events of the day -- would Obama wear the Secret Service chronograph that he had been wearing, during his campaign (and which might have become his "lucky watch") or would he go back to the TAG-Heuer watch (which might have some sentimental value, from his days as a young law professor, community organizer or newlywed)? 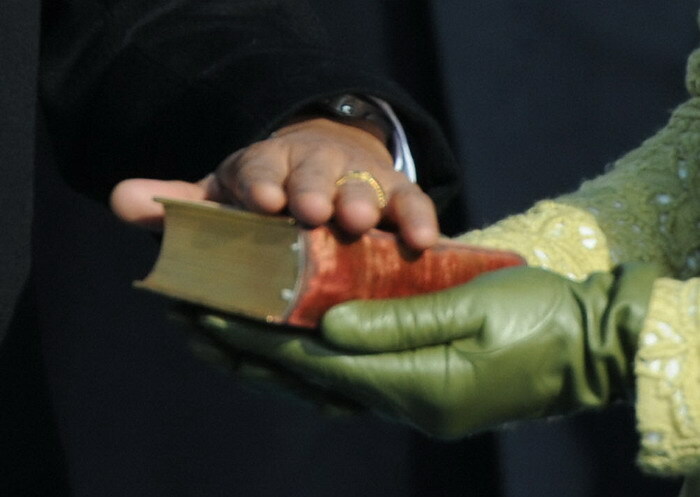 The weather in Washington, D.C. was very cold on the day of the Inauguration, meaning that Obama would be wearing long sleeves, an overcoat and leather gloves. It was much easier watching his watch during the hot summer days, when he was campaigning in the Deep South, with his sleeves rolled up. 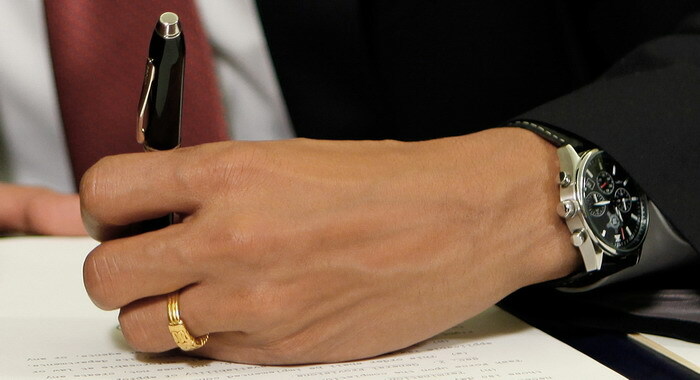 In subsequent days, with each signing of additional executive orders, members of the public saw President Obamas "Secret Service" chronograph, and asked the question: "Which watch is Obama wearing?" I chose to ignore this watch for a couple of reasons: First of all, I assumed that it was some sort of non-descript Timex Ironman, Casio or Nike sports watch, and that it would be very difficult to identify the exact make and model. I mean isn't it a fact that so many of these watches look alike, and the one that I was seeing in the photos looked just like all the others, more or less. Second of all, I had the "it's just a plastic sports watch" mentality. Frankly, I just didn't care much about whether this lump of multi-functional plastic was one brand or the other. So why serach for information if you expect that finding it will not even be interesting? 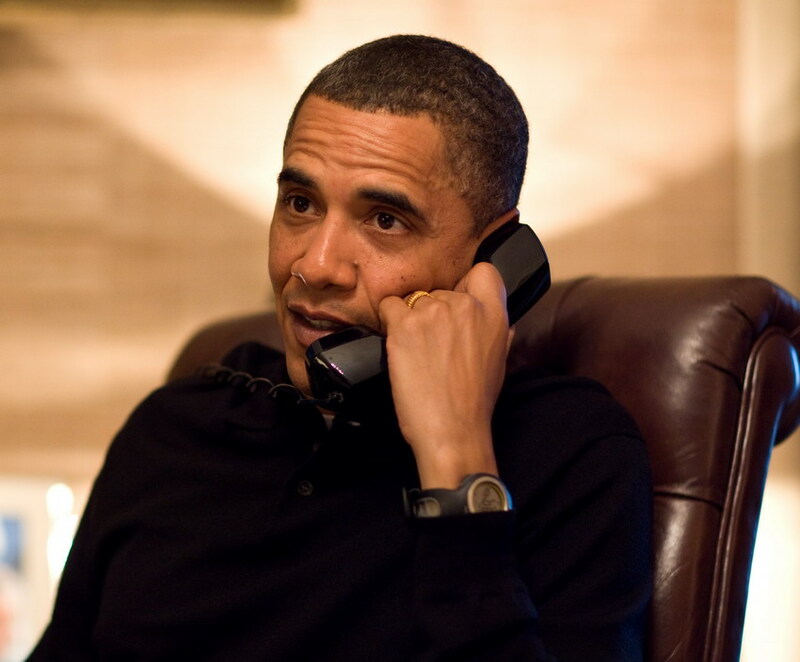 Then, in January 2010, a strange thing happened: Having the customary look through the White House Photo Stream, on Flickr, I came across an amazing photo, of President Obama, sitting at his desk in the Oval Office. 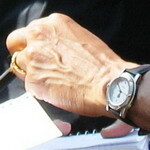 In 18 months of examining photos of Obama, this was the clearest photo that I had seen of his sports watch, and I decided to grab the photo, crop it to show the watch in full detail, and post the photo on a discussion forum, with the question, "Who can identify this watch?" What a surprise when, after only a few minutes, someone had posted a message on the discussion forum, correctly identifying Obama's sports watch as the Highgear Enduro Compass watch. Suddenly, I became interested in learning more about this watch, so that I could share that information on this webpage. 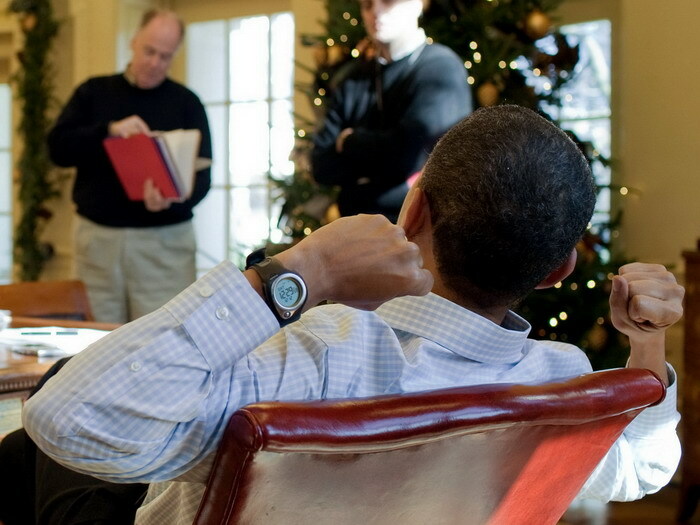 December 12, 2009: President Obama at his desk, wearing the Highgear Enduro Compass watch. 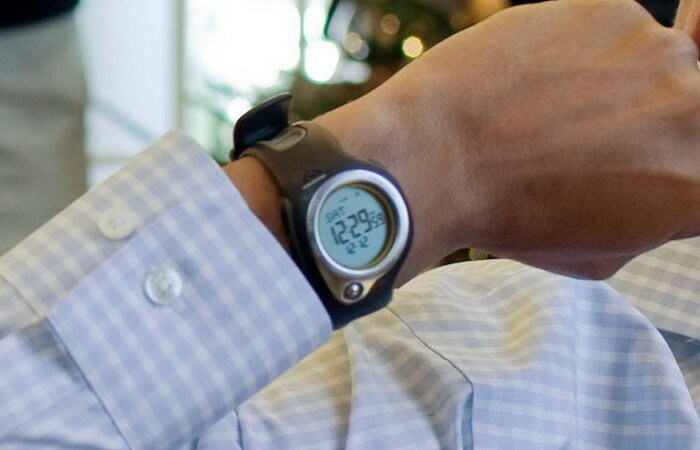 Watching a movie in the White House Theater, holding a meeting (in casual clothes), or on the phone at his desk, all good occasions to wear the Highgear Enduro watch. 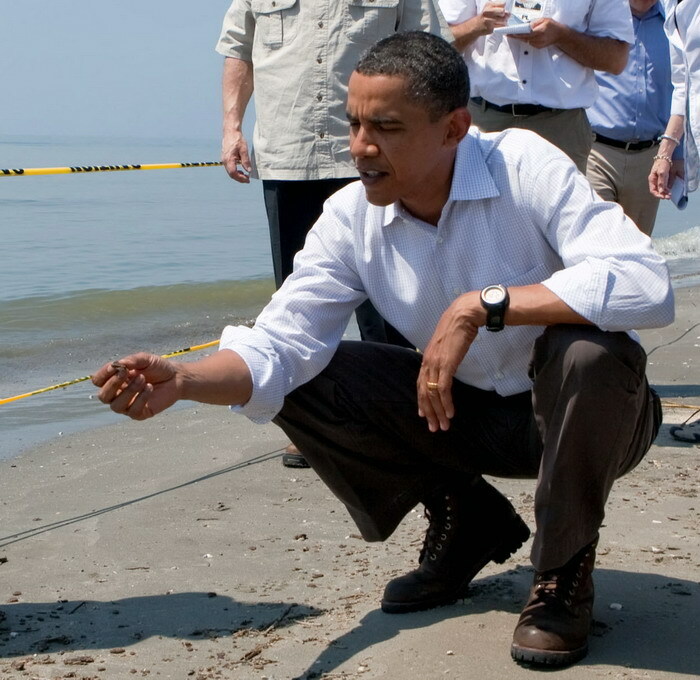 Probably one of the most visible events at which he wore the Enduro was during a trip to the Gulf of Mexico, in June 2010, to inspect some of the damage done to the beaches by the oil spill from the Deepwater Horizon oil platform. Notice the work boots, presumably of the oil resistent variety. Having now identified President Obama's sports watch, let's take a closer look at the Highgear Enduro Compass watch. 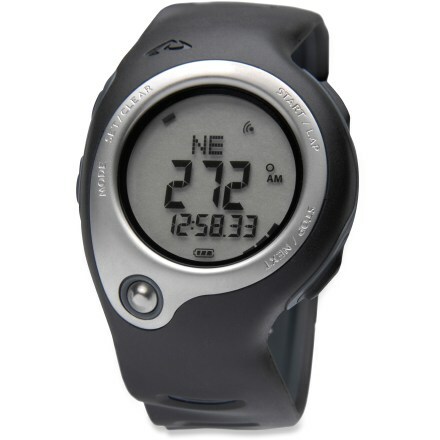 Highgear is a manufacturer of altimeters, compasses, sports timing devices, and gear and accessories. The "Enduro Compass" is part of the line of sports timing devices, and is described as "Trail Running Wristwear" or "Endurance Wristwear". The Enduro Compass has six basic modes of operation: (1) time of day, (2) chronograph, (3) review of stored data, (4) timer, (5) compass, and (6) alarm. Key features include a digital electronic compass, a 100 split lap memory, a 100 lap memory, a 24-hour chronograph, a 24-hour timer, three alarms, and dual time zones. The chronograph has 1/100 second resolution. The compass shows directional readings in 1 degree increments, and can be calibrated to compensate for the magnetic declination at a particular location. The watch is water resistent to 50 meters, and has a mineral crystal. The Highgear Enduro Compass currently retails for $, and is available through [to be added], as well as Amazon, REI and [others]. Add information about the current version; relationship with New Balance. The Enduro was designed by Highgear, and is manufactured in China. About the Company -- Highgear. Highgear is headquartered in [to be added]. According to its Facebook page, Highgear was born in the Appalachian Mountains in 1999, when outdoor enthusiast Mike Hosey had a vision to create his own unique line of compact and affordable outdoor navigational tools. Aiming to enhance its customers' experience of the natural world, Highgear evolved significantly in 2001. Watches, hand-held navigational devices, and pedometers were added to the product base, while infusing the entire line with top notch design. Highgear is passionate about the outdoors. Company enthusiasts spend their time skiing Sugar Mountain, biking Bent Creek, hiking Pisgah National Forest, and paddling the French Broad River. This is where the company field tests its products. The company measures durability, accuracy, and reliability, and then spends hours brainstorming how to make improvements on intuitiveness, design, and function. The result is a line of high-performance tools that make outdoor adventure easier and more fun. Read more on Highgear's website. 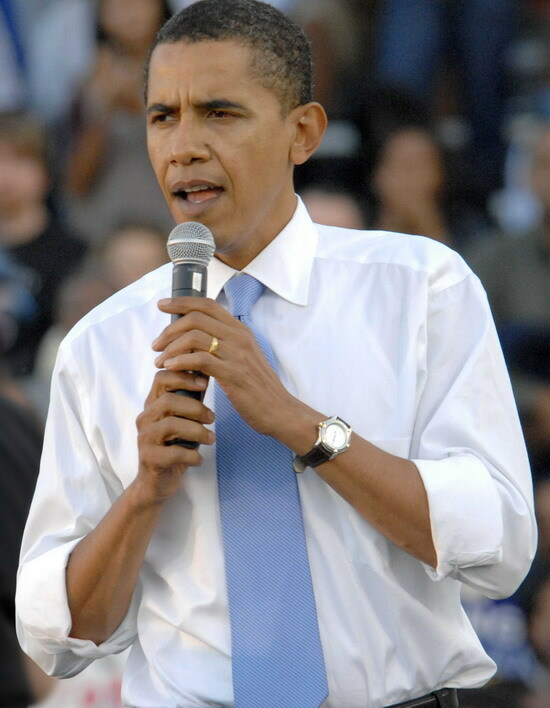 It's September 3, 2009 now, almost one full year after I first started watching Obama's watches. And I will admit it: that over the period from September 2008 through Obama's Inauguration in January 2009, I did get tired of this story . . . really, really tired of this story. There were periods when I was checking for photos on a daily basis, responding to numerous e-mail messages, keeping up with dozens of blog postings about Obama's watches, staying current with the principals at Jorg Gray, watching for EBay auctions, and "promoting" the story in various media outlets. Traffic at OnTheDash almost doubled, and over certain periods, there were more "hits" on Obama's webpage than on all the other pages of the website, combined. So for the past several months -- February through August 2009 -- I stopped following the story. Yes, I would have a look at Getty Images every once in a while, to see what Obama is wearing, but there hasn't been much to report. Obama has worn the Jorg Gray "Secret Service" chronograph daily, with only the occasional switch to the Nike or Timex digital watch, when he goes for a run, for a swim, etc. This evening, I was clicking thorugh some messages on Twitter, and I noticed a couple of new blog postings covering Obama's watches. Yes, almost one full year later, people are still writing articles, columns and blog postings about President Obama's watches. Every day, there are numerous Google searches relating to "Obama's Watch" or "What Watch Does Obama Wear", and many of these searchers end up on this webpage. Accordingly, I have decided to continue with some entries on this page. I am certain that I will not be covering this story with anywhere near the intensity of the period from September 2008 through January 2009; still, it might be useful to have a place to write the occasional note or add a link to an interesting article or blog posting. With that introduction, I will switch to a "journal" style, adding notes as items come to my attention; also expecting that I may get tired of maintaining this page, in which case, it will again go silent. 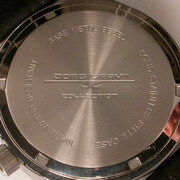 September 3, 2009: Gear Patrol blog entry covering Obama's Jorg Gray chronograph. 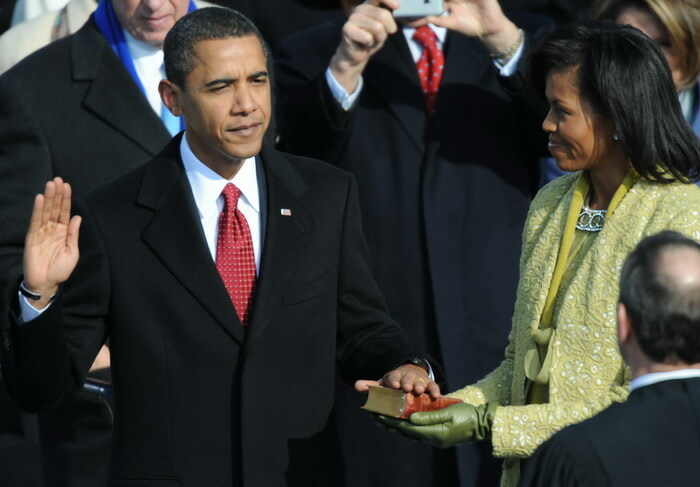 September 4, 2009: Here's a Luxist blog entry, describing the Vulcain Cricket watch that has been given to President Obama; he may have received this watch, but a quick review of Getty Images shows no evidence that he is wearing it; seems unlikely that we will be wearing a $6,500 Swiss watch. 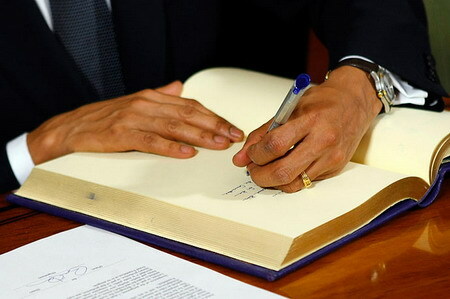 September 9, 2009: Addressing a joint session of Congress to discuss healthcare reform, President Obama has switched back to his TAG-Heuer Series 1500 watch. I wonder whether he might have thought that the TAG-Heuer would have more bipartisan appeal? It seems that Congressman Wilson did not approve. The next day, he is back to the Jorg Gray. 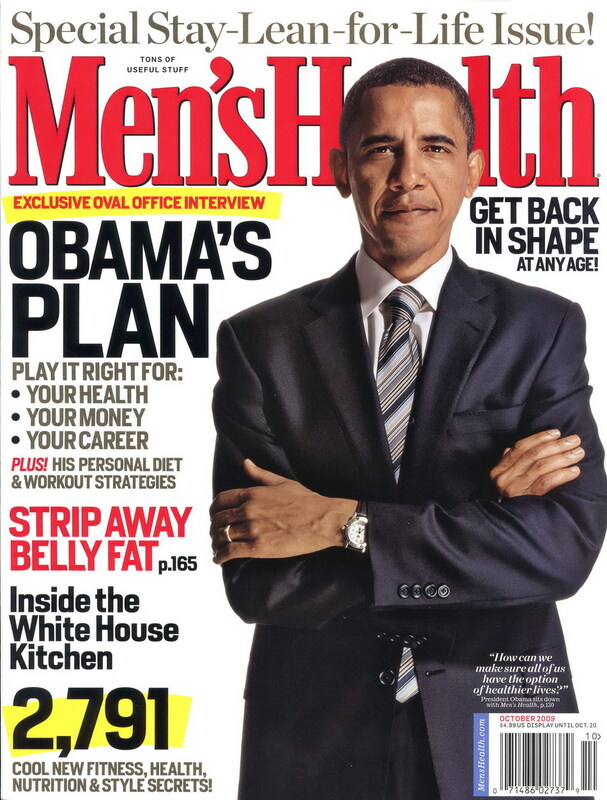 September 15, 2009: The October 2009 issue of Men's Health magazine has Obama on the cover, wearing his TAG-Heuer Series 1500 watch. I suspect that this portrait was taken well before the publication of this magazine; still, it's great to see the TAG-Heuer on the cover. So tell me, how much would any watch brand pay to have its watch shown on the cover of this magazine!! Well done, TAG-Heuer!! November 24, 2009: For the first State Dinner of his Presidency, Obama is wearing the TAG-Heuer Series 1500 watch. 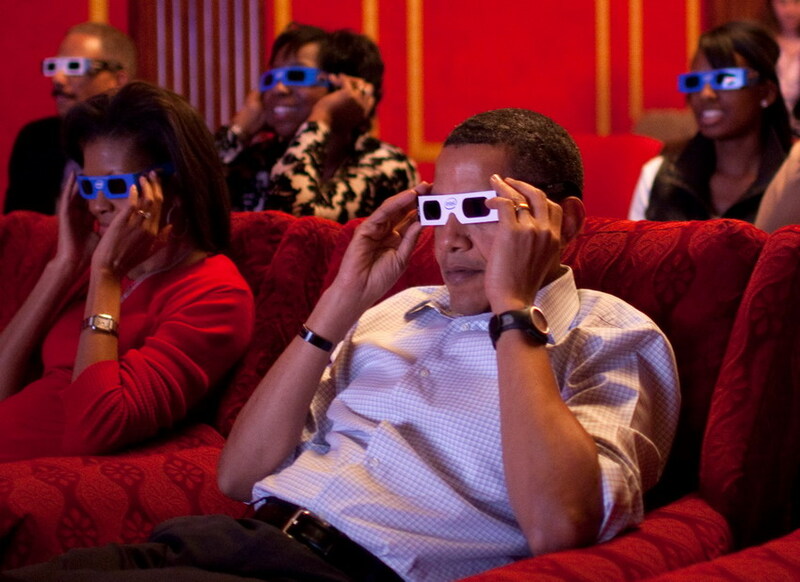 December 3, 2009: The Times of London runs the story,"The search for Barack Obama's watch". 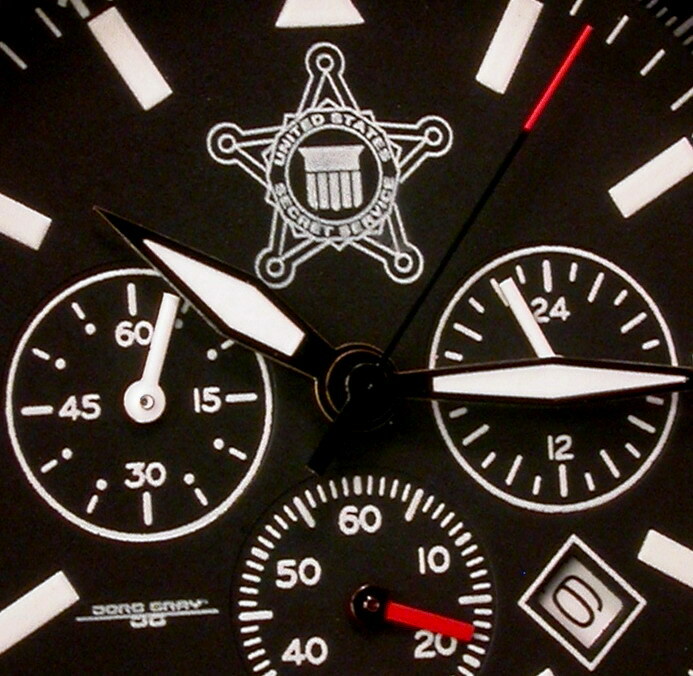 Here is an excerpt from the article, describing the "Secret Service chronograph: "The watch started life as one of only 50 produced for members of the Secret Service two years ago. 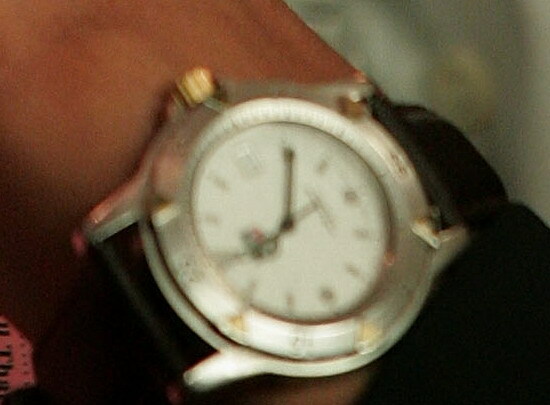 Soon after, the then presidential candidate was given one by his security detail for his 46th birthday in August 2007 and he swapped it for his TAG Heuer. A frenzy began among watch nerds to identify it. The fact that Obama had dumped his trusty Tag for a confusingly obscure model became the subject of heated debate on the internet. Foremost among the watch detectives was Jeff Stein, a civil lawyer from Atlanta, who made it his business to find out which brand Obama had switched to." Unbelievable! This is the story that just won't go away! 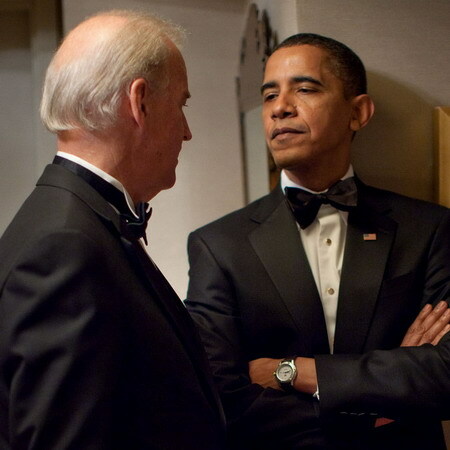 December 6, 2009: Here is an interesting photo (below) of President Obama and Vice President Biden, as they wait before Kennedy Center Honors at the John F. Kennedy Center for the Performing Arts in Washington, D.C. There is much discussion about the body language and messaging, between the President and the Vice President. One thing we can all agree on: It's a great photograph of the Tag-Heuer Series 1500! December 10, 2009: In Oslo, Norway, President Obama wears his TAG-Heuer Series 1500 watch (below) to accept the Nobel Peace Prize. A pattern seems to be emerging, with the President wearing the TAG-Heuer for special occasions. One question for further study: For this sort of travel, is Obama packing both watches -- the TAG-Heuer and the Jorg Gray -- or does he just select one watch for the trip? If he is switching off watches, from one day to the next or from one event to the next, then that definitely makes him a "watch guy". 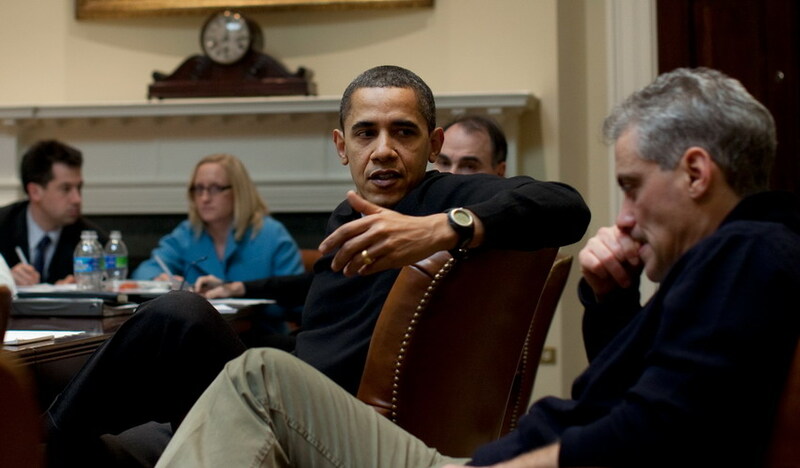 September 10, 2010: FT.com (part of Financial Times) runs the story,"Jorg Gray: Obamas watch is epitome of recessionista chic, describing Obama's Secret Service watch, and what this has meant to Jorg Gray, as a watch company.